Temporarily: reduces fever; relieves minor aches and pains due to the common cold, flu, sore throat, headaches and toothaches. Lasts up to 8 hours. For ages 2-11 years. Great convenience: long duration means fewer doses needed per day. Alcohol free. Do not give more than directed. Shake well before using. Find right dose on chart below. If possible, use weight to dose; otherwise use age. Repeat dose every 6-8 hours, if needed. Do not use more than 4 times a day. Measure only with the blue dosing cup provided. Blue dosing cup to be used with Children's Advil Suspension only. Do not use with other products. Dose lines account for product remaining in cup due to thickness of suspension. Under 24 lbs, under 2 yrs., ask a doctor. 24-35 lbs, 2-3 yrs., 1 tsp. 36-47 lbs, 4-5 yrs., 1 1/2 tsp. 48-59 lbs, 6-8 yrs., 2 tsp. 60-71 lbs, 9-10 yrs., 2 1/2 tsp. 72-95 lbs, 11 yrs., 3 tsp. One dose lasts 6-8 hours. Important: Read all product information before using. Keep this box for important information. This product is intended for use in children ages 2 years - 11 years. Allergy alert: Ibuprofen may cause a severe allergic reaction which may include hives, asthma (wheezing), facial swelling, shock. Stomach bleeding warning: Taking more than recommended may cause stomach bleeding. Sore throat warning: Severe or persistent sore throat or sore throat accompanied by high fever, headache, nausea, and vomiting may be serious. Consult doctor promptly. Do not use more than 2 days or administer to children under 3 years of age unless directed by doctor. 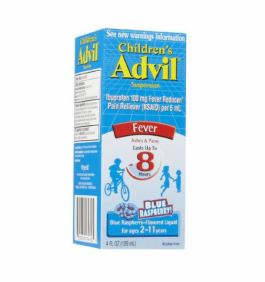 Do not use if the child has ever had an allergic reaction to any other fever reducer/pain reliever. Ask a doctor before use if the child has: not been drinking fluids; ulcers; bleeding problems; lost a lot of fluid due to continued vomiting or diarrhea; problems or serious side effects from taking fever reducers or pain relievers; stomach problems that last or come back, such as heartburn, upset stomach or pain; high blood pressure, heart or kidney disease or is taking a diuretic. Ask a doctor or pharmacist before use if the child is: under a doctor's care for any serious condition; taking any other product that contains ibuprofen, or any other pain reliever/fever reducer; taking a prescription drug for anticoagulation (blood thinning); taking any other drug. When using this product give with food or milk if stomach upset occurs. Stop use and ask a doctor if: an allergic reaction occurs. Seek medical help right away; fever or pain gets worse or lasts more than 3 days; the child does not get any relief within first day (24 hours) of treatment; stomach pain or upset gets worse or lasts; redness or swelling is present in the painful area; any new symptoms appear. Keep out of reach of children. In case of overdose, get medical help or contact a Poison Control Center right away.